"Kid Amazo" - Part 4: "Human, All Too Human"
Frank Halloran watches as his now ex-girlfriend Sara walks away after breaking up with him. Wonder Woman had told Sara about Frank's true nature as "Kid Amazo" and broke things off, which led Frank to believe that Wonder Woman is evil. Just as he begins to contemplate the philosophical implications of whether his thoughts are his own or just programming when he notices a red blur dash into an alleyway. The red blur was the Flash, who joins the rest of the League just in time to debate whether or not Wonder Woman was right in telling Sara the truth about Frank. Batman believes it was a good call while the Flash would have preferred to have had the group vote on the subject. Regardless Superman suggests that since they're reaching a critical stage in the battle for Frank's soul that the League should begin twenty-four hour surveillance and be ready to respond at a moment's notice. In the shadows Frank watches and then disappears. As Superman and Batman prepare for Frank's eventual attack Kid Amazo begins to revel in what could possibly be his evil side. He uses his powers to get the criminal gang called the Alpha Punks free from police custody on their way to Arkham Asylum, but even in doing that Frank was probably saving them from going crazy there. Batman watches a news feed of the prison break Kid Amazo makes his move. After Frank enters Batman's inner sanctum the Dark Knight traps him between two giant steel doors. At first Frank thinks that breaking out will be easy until the green Kryptonite that Batman laced the doors with starts to take its toll on him. Frank manages to escape by cracking Batman's lock, which was a kind of personality profile key. All Frank had to do was access Batman's "abilities" and the rest was easy. The two fight with Frank taking an early lead. He demands that Batman call Wonder Woman to the scene to answer for what she did. Batman tries to reason with him but to no avail. A quick tap of his utility belt allows Batman to send out a high-pitched noise that summons a large number of bats from deep within the cave. Frank flies off and crashes into Sara's house. The police arrive shortly and Frank tells them that all he wants is to deal with Wonder Woman and that she should come in person and alone or Sara gets hurt. Sara, like everyone else, tries to reason with him and insists Wonder Woman won't come. Frank gives her an ultimatum; take him back or he'll kill Wonder Woman. Sara informs him that his behavior is rather pathetic. Frank fires back that his reaction is very human and that people have been turned bad for worse reasons. Wonder Woman and Flash get to Sara's house first. After telling Flash that Frank really doesn't want to hurt her Wonder Woman is tackled by Kid Amazo and the two begin to fight. Wonder Woman yells for the Flash to get the girl to safety just as the rest of the League appears. Batman tells him that while he may be the son of Amazo with the ability to replicate each of the League's individual powers there is something else he needs to know. Story - 4: Oh wow, an actual cliffhanger ending. Usually it's Geoff Johns who deals in that sort of trade but here Peter Milligan uses it to good effect. I mean I was going to pick up the last chapter anyway (I review the book, I buy it, its how I roll) but now I feel like I HAVE to get it to see what happens next. That, however, will have to wait. For now we were treated to another solid chapter in a very entertaining and engaging story arc. Frank's internal struggle continued like a runaway train this month as he struggled to deal with how many of his actions were his own choice and what actions could be the programming of his creator. What I liked the most about the emotional undercurrent of this issue is that Frank "going bad" came from the very human feeling of rejection. Sara broke up with Frank and like a lot of emotional unstable men he reacted by putting the blame onto Wonder Woman and, by extension, the Justice League. He initially lashes out and embraces the dark side everyone assumes he has by breaking the Alpha Punks out of police custody. He doesn't exactly help them as he leaves them on the side of the road before going off to confront Batman, but Milligan has him make the comment that when the Justice League finds out about what he did they will think he had gone bad and that maybe he has. This cast doubt on why he was acting in the manner of a villain, which was a nice touch on Milligan's part. Because everything that happened in this issue was caused by Wonder Woman telling Sara about Frank's true nature I almost feel bad for him. Not that I excuse any of his actions. I've never been one for men who get dumped and then react in some sort of violent manner to deal with it, but this was different, for good or ill.. This situation, with the fancy costumes and super powers, is different from a real life situation of an angry-ex holding the ones he loved hostage, but there was still a lot of truth in the way Milligan wrote the dialogue. I also like how he played with Frank's abilities. Milligan had him using them to full effect and that made for some interesting fight sequences. The scene between Frank and Batman in the Batcave was especially good as it showed that while Batman may have no special powers he does have abilities that Frank can tap into and use albeit for the singular purpose of breaking to Batman's underground headquarters. As stated the cliffhanger ending was used well in this issue. It was dramatic and gave me that kind of fanboy charge especially that shot of the Justice League assembled and ready to defend their own. Batman's dialogue and the question of what he meant by telling Frank that there is something about him that he should know got to me. I'll cop to it any day of the week and twice on Sunday. I'm a sucker for that kind of pacing and storytelling. Normally I'd be worried that it will all fall apart next issue, but considering the first four chapters were great I am going to walk blindly into the fifth chapter assuming that I will love ending. Art - 4: Despite the fact that the final page looked a bit... off I was pleased with the art in this issue. It has consistently fit the atmosphere and tone of the story. 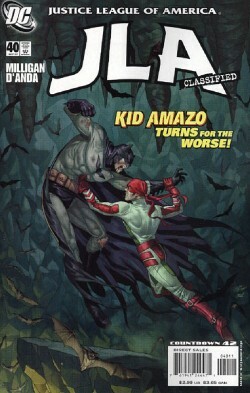 D'Anda has a good grasp of storytelling and I especially liked the fact that when Batman and Kid Amazo squared off they were in similar stances. It made for a great looking panel. Cover Art - 4: Ow. That looked like it smarted just a bit. Sami Basri turned in a dark yet exciting cover for this month's issue and I think the comic was better for it. Yeah Frank's costume is different on the cover than it is in the comic but with how much I enjoyed this cover I can let that slide.